Hello my dear blogging buddies! My, how long it has been! I apologize for my extreme tardiness in posting. All I can say is life just sometimes gets in the way. I started my new teaching job (love it!) and am still trying to adjust to my new schedule. I have been wearing my teacher hat late into the evenings and unfortunately, my stitching has taken a back seat. Yes, that is an original Clark's Company Spool Cabinet. Was I lucky to be the winning bidder or what? I was so excited (still am!) and have been working on "sprucing it up." Really all it needed was a good washing with some Murphy's Oil Soap. I have now taken to oiling the outside with good ol' furniture oil. Once I polish the brass knobs, she will look almost new! Believe it or not, when I have a moment to spare, I try to read the blogs. I have been pea green with envy watching Margaret's progress on the same sampler over at Sampler Lover's Blog. This is such a beautiful piece and I am thrilled that Margaret is stitching it too. Watching her reminds me that yes, I can finish it too! 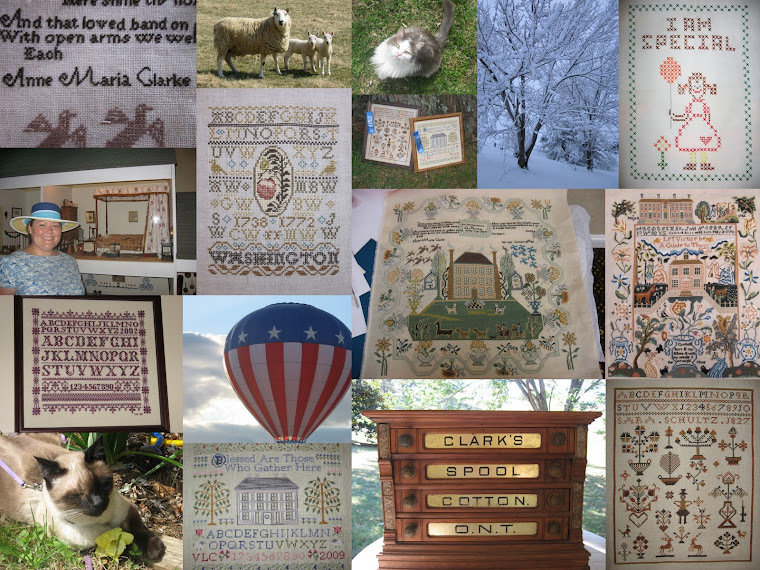 I just love the Richmond Sampler and have been doing a little research on the young lady who stitched the magnificent original. Anne Maria Clarke was from Virginia and is buried in Richmond. I hope to have more interesting tidbits on Miss Clarke soon...I do enjoy getting to know the young ladies whose stitching I love to reproduce. Again, I apologize for being absent for so long. I have numerous emails to send out and even more blogs to visit and comment on! I promise to catch up and I will enjoy every minute! Thank you all for stopping by and I love hearing from you! Awesome find at the estate sale, Valerie! What a treasure you have! Your Richmond Sampler is coming along and fascinating tidbits about the stitcher. Oh, I am so envious - I just love your auction find! That cabinet is amazingly beautiful! You are so lucky! You are doing great with your Richmond sampler. It's great to have Margaret stitching it too as she's great for providing inspiration to keep going! Oh gosh, you are soooo lucky to have gotten that spool cabinet! I've been wanting one forever! Love seeing your Richmond Sampler -- you're the reason I wanted to stitch the piece! :D I'm still working on the border -- we don't get to start the inside till our next assignment. I'm ready for it -- I'm sick of the border! lol! It looks like things are going well for you! The job sounds great, you are still getting some stitching done and you have weekends off! Yahoo! The spool chest is amazing! Congratulations. I hope that you are enjoying reading Katherine. I think that is my favorite Anya Seton book. OHH! So jealous of your auction find. Wonderful! I'm glad you like your new job, even if you can't stitch as much as you like. I can't even stand it that you got one of those cabinets! LUCKY GIRL!! It's so beautiful! What a great find at the auction! Glad you're enjoying your new job and how nice to see a progress pic on your Richmond Sampler. I love that sampler and the cabinet is awesome, but as a teacher I want to wish you a great fun with the job and most of all to keep your levels of patience always as high as possible so that you can appreciate it. I have been teaching for over 20 years and this year due to a open heart operation I am still home, but missing my teenagers. Glad you are enjoying your new job, hopefully you will settle in soon and have a bit more time in the evenings. Your Richmond piece is gorgeous. What a fun find too! Can't wait to see what you do with it. I was so excited to see a post from you! Hope we get to see a little more of you! Love that auction find! Very lucky indeed! What an AWESOME find at the auction! I have been keeping my eye out for something like this. LUCKY GIRL!! It's good to see you posting again. I understand completely about not have much time to devote to blog reading and posting. I am in that boat right now. I love your auction find! Don't apologize for being behind in blogging. Enjoy life and post when you can. ;) Your stitchy progress is wonderful--how fun to do research on the stitcher! Welcome back! Don't forget blogging without guilt - life just goes in many directions some times. Love your new cabinet, I'm jealous! Just found your blog - lovely stitching. And the book you're currently reading was one of my very favorites about 30 odd years ago. Hope you're enjoying it. LOVE love love your Clark's Cabinet and your beautiful laughing-out-in-the-field wedding picture. Gorgeous Spool cabinet, what a find! !